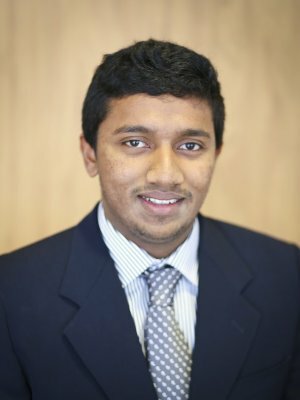 Aritha Weerasinghe ’18, an accounting major from Sri Lanka, plays tennis and works as a student accounting assistant in his free time. He plans to work as an accountant for a few years after graduation, but hopes to start his own business someday. It is a small community, and I am able to engage in it. Professors are very friendly and easily approachable, and they are willing to help with anything. I am also able to work on campus at the same time as being a full time student, so I am able to help my parents financially. How has your GC experience influenced your faith and worldviews? The core values are perfect for my faith beliefs. I think GC has also given me a new perspective on other worldviews, as I am able to hang out with people from all over the world. What is your favorite experience at GC so far? Being a resident assistant really helped me get to know the students better and has helped me get involved in different types of activities. It is a good leadership position on campus that will help students to improve their leadership skills, which will help them in the future. The best advice I can give is to manage time well. I would also say that you should enjoy life, and by this I mean to have a good social life and study hard at the same time. What has your experience been like attending a small college far from home? It was definitely a challenging thing, because it is totally different from my high school back home. But because I’m going to a small college, I know almost everyone on campus and I’m friendly with each one of them. What surprised you about Goshen College? One thing that surprised me was that students call professors by their first name. When I was in high school, we were taught to respect our teachers by calling them “sir” or “madam.” When I came to college and students were calling the professors by their first name, at first I thought it was really disrespectful. However, I found out that it’s just the cultural difference — professors do not mind being called by their first name. I want to work as an accountant for a few years and see what it is like — I enjoy accounting, but I am not sure if it is something I would do for the rest of my life. So, after some work experience, I will decide if I am going to continue accounting or start my own business.